Big Data is a collection of both structured and unstructured data in large volumes. These huge volumes of data provide an opportunity for businesses to take smart decisions by using appropriate analytics. 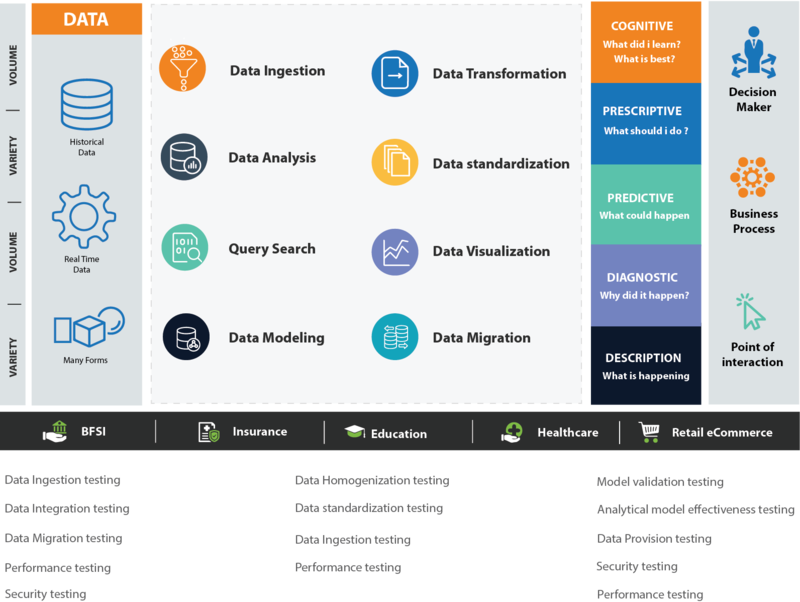 Analytics is the discovery, interpretation, and communication of meaningful patterns in Big Data; and the process of applying those patterns towards effective decision making. Our Big Data & Analytics Testing services ensure validation of structured and unstructured data processing, migration & transformation using Data Warehouse tools and testing of various models across platforms. Our end-to-end test approach ensures testing of the system requirements and test data needs, system health checks by benchmarking key performance metrics and periodic vulnerability assessments.